La compétition en patinage de vitesse des Jeux de Pyeongchang s’est conclue aujourd'hui avec le départ en groupe. C’était la première fois que la spectaculaire épreuve du départ en groupe était patinée aux Jeux olympiques. L’Italienne Francesca Lollobrigida a été dominante dans la première demi-finale, franchissant la ligne d’arrivée en première position en plus d'amasser quelques points dans les sprints intermédiaires. La spécialiste du patinage sur roues était l’une des favorites pour l’emporter dans la grande finale. La Canadienne Keri Morrison a fait une course impeccable et a terminé au troisième rang pour gagner sa place en finale tout comme Dan Guo, Irene Schouten, Nana Takagi et Kim Bo-reum toutes bien connues sur le circuit. La deuxième vague a été un peu plus mouvementée alors que la Canadienne Ivanie Blondin a perdu l’équilibre en sortie de virage. Blondin a emporté la Japonaise Ayano Sato et la Néerlandaise Annouk van der Weijden dans sa chute. Sato et Blondin, respectivement 4e et 6e au classement de la Coupe du monde, seront absentes de la grande finale. Van der Weijden a tout de même réussi à revenir sur le peloton et franchir la ligne au deuxième rang, se qualifiant pour la finale malgré sa chute. Une médaille sur la distance viendrait mettre un baume sur la déception de van der Weijden suite à sa performance sur 5000m plus tôt dans les Jeux. Sa prestation en demi-finale a clairement prouvé à ses adversaires qu'elle était en forme. L’Autrichien Linus Heidegger a été le premier a passer la ligne d’arrivée à la suite d’une échappée avec l’Italien Andrea Giovannini et Shane Williamson du Japon. Ces trois patineurs allaient être de la finale. Les autres favoris dont Lee Seung-hoon, Alexis Contin, Koen Verweij et Olivier Jean seront également de la finale. Peter Michael a patiné avec confiance et a franchi la ligne en premier lors de la deuxième demi-finale. Les patineurs se sont battus tout au long de la course et presque tous les patineurs ont amassé des points dans cette demi-finale. Sven Kramer, qui patinait son premier départ groupé de la saison a fait une solide course en amassant 6 points. Les patineurs de vitesse sur roues Bart Swings, Livio Wenger et Joey Mantia allaient aussi être de la finale. Saski Alusalu a débuté sa course comme elle l’avait fait plus tôt cette saison à Calgary en tentant de partir en échappée. Elle a finalement été rattrapée par le peloton avec trois tours à faire. C’est un sprint à sept patineuses qui se dessinait. La Japonaise Nana Takagi a remporté le sprint devant la favorite locale Kim Bo-reum et la Néerlandaise Irene Schouten. Lollobrigida qui mène le classement de la Coupe du monde sur la distance a terminé en 7e position. Plusieurs ont tenté de s’échapper du peloton dans cette grande finale, mais c’est finalement au sprint que tout s’est joué. Personne n’a réussi à suivre le Coréen Lee Seung-hoon au sprint qui a remporté la médaille d’or devant les siens. Il y a un peu de son jeune coéquipier de 16 ans Jaewon Chung dans la victoire alors que ce dernier a tiré le peloton pendant plusieurs tours pour revenir sur l’échappée et permettre à Lee de batailler au sprint. Le Belge Bart Swings et le Néerlandais Koen Verweij ont terminé deuxième et troisième. Livio Wenger qui a passé toute la course dans l’échappée termine quatrième grâce à ses 11 points. Les médaillés des Championnats du monde 2017 Joey Mantia, Alexis Contin et Olivier Jean ont eu des courses plus difficiles et ont terminé respectivement 9e, 10e et 14e. C’est tout pour le patinage de vitesse longue piste à Pyeongchang. Le prochain rendez-vous longue piste est le Championnat du monde sprint à Changchun en Chine les 3 et 4 mars. Visitez la page regroupant tous nos articles des Jeux de Pyeongchang en cliquant ICI. Mass start races concluded the speed skating events of the Olympics today at the Gangneung oval in front of a roaring crowd. It was the first time that the spectacular mass start event was raced at the Olympic games. Francesca Lollobrigida from Italy was dominant in the first semifinal gathering some sprint laps’ points and crossing the finish line in first position. 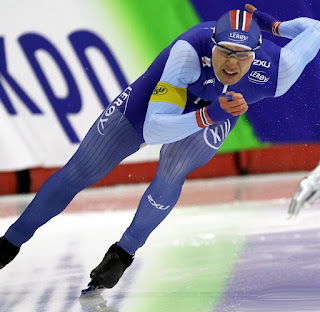 The inline speed skating specialist came to Pyeongchang as one of the favorite to win the mass start. Canada’s Keri Morrison did a perfect race and finished in third place to qualify for the final alongside Dan Guo, Irene Schouten, Nana Takagi and Kim Bo-reum who also finished in the top 8. There was a bit more action in the second ladies semifinal as Ivanie Blondin fell and took out Ayano Sato and Annouk van der Weijden. Sato and Blondin, who are respectively fourth and sixth in the World cup classification, would not take part in the finale. Van der Weijden managed to come back to the pack and finished second despite the fall. A medal on the distance would help her sweetened her heartbreaking fourth place on 5000m. Linus Heidegger from Austria was the first to pass the finish line in the first semifinal after a little breakaway with Andrea Giovannini from Italy and Shane Williamson from Japan. The three qualified for the main event. Other favorites including Lee Seung-Hoon, Alexis Contin, Koen Verweij and Olivier Jean also qualified for the final as they concluded the race in the top 8. Peter Michael raced with confidence in the second semi and was the first to finish the 16 laps race. Almost every skater got sprint points in this race and it was a matter of who got the most. Sven Kramer who was racing in his first mass start of the season did a solid race and collected 6 points to earn his ticket for the A final. Inline speed skating specialists Bart Swings, Livio Wenger and Joey Mantia also managed to qualify. Saskia Alusalu started her race like she did in Calgary earlier this season by trying to escape the pack with a breakaway. The pack came back on her with 3 laps to go to prepare for the sprint. Nana Takagi from Japan won the sprint finishing ahead of crowd favorite’s Kim Bo-reum and Irene Schouten from the Netherlands. Alusalu got fourth place with the 15 points she won in the intermediate sprints. Lollobrigida who’s leading the mass start World cup classification finished in 7th. A lot of skaters tried to escape from the pack in the final but it was finally the sprint that decided the podium. Nobody was able to beat Korean star Lee Seung-hoon in the last stretch. His 16 years old teammate Jaewon Chung as a little bit to do with this victory as he leaded the chase group for a long time to help Lee come back on the breakaway and fight in the sprint. Bart Swings from Belgium and Koen Verweij from the Netherlands finished in second and third. Livio Wenger who was in the breakaway for the majority of the race finished fourth with 11 points. The 2017 World championships medalists on the distance Joey Mantia, Alexis Contin et Olivier Jean had a difficult race and finished 9th, 10th and 14th. That’s it for speed skating at the Olympic games! The next long track event will be the Sprint world championships that will be held in Changchun, China on 3th and 4th March. The Dutch are golden again as Kjeld Nuis comes out on top in the 1000m. Havard Lorentzen, the 500m winner from earlier this week, finished in second place to capture the silver medal. Rounding off the podium was 23 years old Tae-Yun Kim of Korea. Kjeld Nuis wins his second gold medal of the games and continues his dominating 2017/2018 season. His speedy time of 1:07.95 was just enough to edge Havard Lorentzen out of first place by 4 one-hundredths of a second. Nuis repeated his performance from last years’ World Single Distance championships as he claimed the top spot in both the 1000m and 1500m. With his performance today, the Dutchman becomes the first man since Gaetan Boucher in 1984 to win gold in both the 1500m and 1000m. With Nuis’ medal today, the Dutch bring their total medal count in speed skating from these games to 14, seven of which are gold. Havard Lorentzen of Norway finished with a time of 1:07.99, and had to play the waiting game to see if his time would hold with two pairs left to skate. The last pair saw Kjeld Nuis overtake him for the top spot, as Lorentzen finished in the silver medal position. The Norwegian was the first of only two men to go sub-1:08.00 today at the Gangneung Oval, and he finishes his Olympic games with one gold and one silver medal. The final podium spot went to Tea-Yun Kim of Korea, much to the delight of fans in the crowd. The 23 year-old vastly improved upon his 30th place finish at the Sochi Olympics, and earned his best international finish in the 1000m with his bronze medal today. 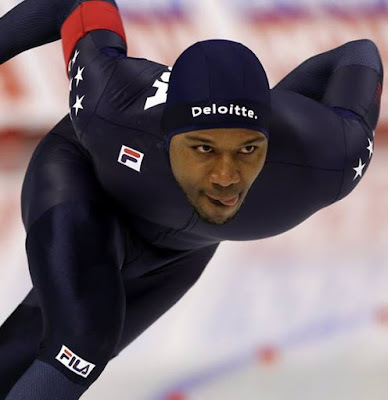 The legendary Shani Davis, ends his final Olympics with a top 10 finish today. The 35 year-old American, who is competing in his fourth and last Olympics, finished his last Olympic race in 7th place with a time of 1:08.78. Davis has four Olympic medals to his name, two gold and two silver, and is the current world record holder in the 1000m. He has previously stated that his goal was to win a medal at the 2018 games, and declined to talk with the media after his race today. Davis’ compatriot Joey Mantia skated in the 13th pair, and finished just off the podium in 4th place. His result today is an improvement on his 15th place finish in Sochi four years ago, but is surely a tough pill to swallow as he was so close to winning his first Olympic medal. Mantia will now shift his focus to the mass start this weekend where he is considered a strong contender to end up on the podium. Three Canadian skaters were in action today at the Gangneung Oval, but the struggle continued for the Canadians as they failed to post any top 10 finishes. The highest Canadian finisher was Alexandre St-Jean who got off to a quick start and finished in 11th place with a time of 1:09.24. The 24 year-old from Quebec City is competing in his first Olympic games after failing to qualify for the Sochi games four years ago. Vincent de Haitre, Cumberland, ON native, finished in 19th place with his time of 1:09.79. De Haitre, who was considered a medal threat in the 1500m, has had a rough go at these Olympic games as he has been suffering from a bruised heel all week. This is a disappointing finish for de Haitre, who finished in 2nd place one year ago on the same ice in Gangneung at last years World Single Distance Championships. Laurent Dubreuil capped of his first Olympic games by finishing in 25th place with a time 1:10.03. Visit our special coverage page to find all our articles related to Pyeongchang 2018 by clicking HERE. Les Pays-Bas remportent l’or une fois de plus alors que Kjeld Nuis gagne le 1000m. Havard Lorentzen, le vainqueur du 500m, a terminé en deuxième position pour décrocher la médaille d'argent. Tae-Yun Kim, originaire de Corée, complète le podium. Kjeld Nuis remporte sa deuxième médaille d'or des Jeux et continue sur sa lancé des derniers mois. Son temps rapide de 1:07.95 était suffisant pour arracher la victoire à Havard Lorentzen par 4 centièmes de seconde. Nuis a répété sa performance du Championnat du Monde des Distances Individuelles de l'an dernier alors qu'il a remporté la médaille d'or au 1000m et au 1500m. Avec sa performance aujourd'hui, le Néerlandais devient le premier homme depuis Gaetan Boucher (1984) à remporter l'or dans ces deux distances lors des même Jeux olympiques. Cette médaille porte le total de médailles Néerlandaises en patinage de vitesse aux Jeux de Pyeongchang à quatorze, dont sept d’or. Havard Lorentzen de Norvège a terminé avec un temps de 1:07.99 et a dû patienter pour voir si son temps allait tenir avec deux paires à patiner. Lorentzen a terminé avec la médaille d'argent, après que Kjeld Nuis l’ait dépassé dans la dernière paire. Le Norvégien a été le premier de deux hommes seulement à passer sous la barre des 1:08.00 aujourd'hui à l'Anneau de Gangneung. Lorentzen termine ses Jeux olympiques avec une médaille d'or et une médaille d'argent. La dernière place sur le podium est allée à Tea-Yun Kim de Corée, au plus grand plaisir des spectateurs présents. L'athlète de 23 ans a considérablement amélioré son résultat des Jeux olympiques de Sotchi alors qu’il avait terminé au 30e rang. Avec son temps et sa médaille de bronze aujourd'hui, il obtient sa meilleure performance internationale en carrière sur 1000m. Shani Davis, qui participe à ses quatrièmes et derniers Jeux Olympiques, a terminé sa dernière course olympique au 7e rang avec un temps de 1:08.78. Davis a remporté quatre médailles olympiques en carrière, deux d'or et deux d'argent, et détient le record du monde sur 1000m. Il avait déclaré que son objectif à ces Jeux Olympiques était de gagner une médaille. Il a refusé de parler aux médias après sa course aujourd'hui. Son compatriote américain Joey Mantia a patiné dans la 13ème paire et a terminé au pied du podium au 4e rang. Il améliore sa performance d’il y a quatre ans à Sotchi où il avait terminé au 15e rang, mais était sûrement un peu déçu lui qui était si près de remporter sa première médaille olympique. L'Américain va maintenant se concentrer sur le départ en groupe ce week-end où il est considéré comme un concurrent sérieux pour remporter une médaille. Trois patineurs Canadiens étaient en action aujourd'hui à l'Anneau de Gangneung, le meilleur résultat est venu d’Alexandre St-Jean qui a pris un départ rapide et a terminé au11e rang avec un temps de 1:09.24. Le jeune Québécois participe à ses premiers Jeux Olympiques après avoir raté sa qualification pour les Jeux de Sotchi il y a quatre ans. Vincent de Haître, originaire de Cumberland, ON, a terminé au 19e rang avec son temps de 1:09.79. De Haître, qui était considéré comme un candidat pour une médaille au 1500m, n'a pas eu les Jeux qu'il souhaitait, embêté par une blessure. C'est un résultat décevant pour de Haître qui avait remporté la médaille d'argent il y a un an sur la même glace à Gangneung lors des Championnats mondiaux de distances individuelles. Laurent Dubreuil a complété ses premiers Jeux olympiques en terminant au 25e rang avec un temps de 1:10.03.